Late summer and early fall is a great time to get kids to look out the window of Space Ship Earth. Before even thinking about buying the kids or grandkids a telescope (subject of a later post), teach them first how to find the visible planets, the brighter stars, and the major constellations so they can comfortably move around the night and early morning sky. Knowing how to locate objects with the naked eye is a prerequisite to learning how to use an optical telescope. 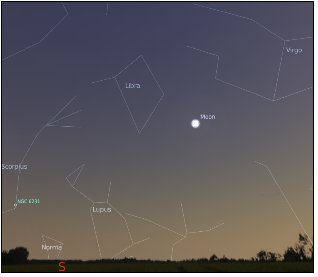 Learning how to use Stellarium will teach kids (or interested adults) the basics of backyard astronomical observation. Kids need to know the basics so they can develop enough of an interest in astronomy to warrant buying them a telescope. And, Stellarium is free! 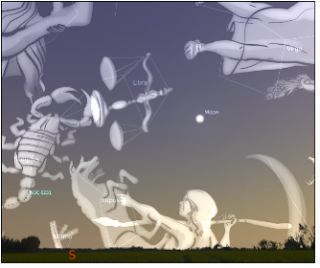 Go to www.stellarium.org and download the Mac or Windows version. 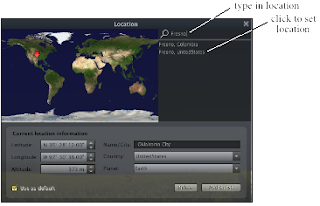 I will now help you set Stellarium to your geographical location and then take you through an example of how to use the program to set up a specific viewing scenario. 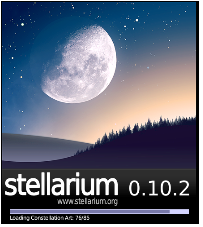 Assuming you've downloaded Stellarium, open the program by double-clicking on its icon. Press the F6 key to open the Location window. In the upper-right corner, type in your location. Your location (or locations near the one you typed) will appear in the window on the right. Move the cursor to this window, and click on the correct location (or nearest location). This sets Stellarium to your latitude, longitude, and time zone. ***IMPORTANT*** Be sure to check the Use as default box in the lower-left corner so that Stellarium loads your location every time you open the program. Press the F5 key to bring up the Date and Time window. 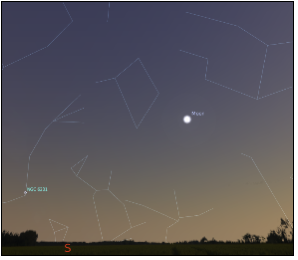 You can set Stellarium to any date and time, but for the viewing scenario I want to create, click on the small arrows to change the numbers in your Date and Time window to correspond to the numbers in the following picture. It is now 5:40 AM. 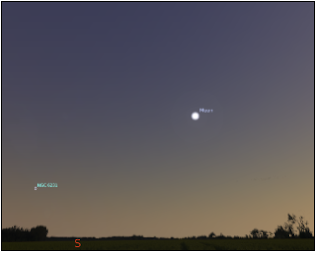 August 27, 2009 in Stellarium. Use the left or right arrow keys to look due east. This is what you will see. 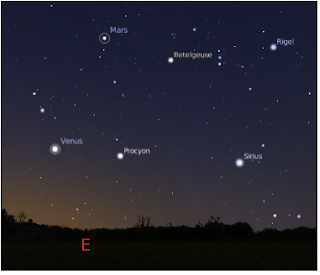 The planets Mars and Venus are visible along with Orion's Belt and the bright stars Procyon and Sirius. That's all there is to it. Use the Date and Time window to create any scenario you like, and then go outside and look at the real thing! There are many other features that you and the kids will enjoy exploring. For example, here's an uniteresting screen shot of the moon and star cluster NGC 6231(object 6231 in the New General Catalog of deep space objects). Press the "c" key and the outlines of the constellations appear. That's a bit more interesting and informative. 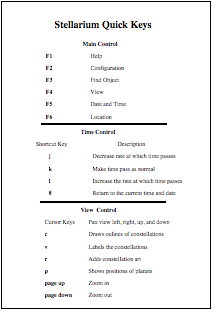 Press the "v" key and the names of the constellations are added to the oulines. Okay. Now I have an idea as to what part of the sky I'm looking at. Press the "r" key and artistic representations of the constellations are added to the sky. All of these keys are toggles so pressing them again turns off the features. Documentation is included in the download but I made a list of the most-used functions. If you would like a PDF of Stellarium Quick Keys, email grandadscience@gmail.com. Many thanks to Roger, a good friend, for getting me to think about an astronomy post. Also, many thanks to the Stellerium developers [listed on the Home page] for their gift.